The Svalbard Global Seed Vault (Norwegian: Svalbard globale frøhvelv) is a secure seed bank on the Norwegian island of Spitsbergen near Longyearbyen in the remote Arctic Svalbard archipelago, about 1,300 kilometres (810 mi) from the North Pole. Conservationist Cary Fowler, in association with the Consultative Group on International Agricultural Research (CGIAR), started the vault to preserve a wide variety of plant seeds that are duplicate samples, or "spare" copies, of seeds held in gene banks worldwide. 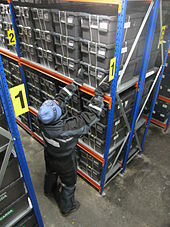 The seed vault is an attempt to ensure against the loss of seeds in other genebanks during large-scale regional or global crises. The seed vault is managed under terms spelled out in a tripartite agreement between the Norwegian government, the Crop Trust and the Nordic Genetic Resource Center (NordGen). The Norwegian government entirely funded the vault's approximately 45 million kr (US$8.8 million in 2008) construction. Storing seeds in the vault is free to end users, with Norway and the Crop Trust paying for operational costs. Primary funding for the Trust comes from organisations such as the Bill & Melinda Gates Foundation and from various governments worldwide. The Nordic Gene Bank (NGB) has, since 1984, stored backup Nordic plant germplasm via frozen seeds in an abandoned coal mine at Svalbard. In January 2008, the Nordic Gene Bank merged with two other Nordic conservation groups to form NordGen. The Svalbard Global Seed Vault officially opened on 26 February 2008, although the first seeds arrived in January 2008. Five percent of the seeds in the vault, about 18,000 samples with 500 seeds each, came from the Centre for Genetic Resources of the Netherlands (CGN), part of Wageningen University, Netherlands. As part of the vault's first anniversary, more than 90,000 food crop seed samples were placed into storage, bringing the total number of seed samples to 400,000. Among the new seeds are included 32 varieties of potatoes from Ireland's national gene banks and 20,000 new samples from the U.S. Agricultural Research Service. Other seed samples came from Canada and Switzerland, as well as international seed researchers from Colombia, Mexico and Syria. This 4-tonne (3.9-long-ton; 4.4-short-ton) shipment brought the total number of seeds stored in the vault to over 20 million. As of this anniversary, the vault contained samples from approximately one-third of the world's most important food crop varieties. Also part of the anniversary, experts on food production and climate change met for a three-day conference in Longyearbyen. Japanese sculptor Mitsuaki Tanabe (田辺光彰) presented a work to the vault named "The Seed 2009 / Momi In-Situ Conservation". In 2010 a delegation of seven U.S. congressmen handed over a number of different varieties of chili pepper. By 2013, approximately one-third of the genera diversity stored in gene banks globally was represented at the Seed Vault. For the seed vault's 10th anniversary on 26 February 2018 a shipment of 70,000 samples was delivered to the facility, bringing the number of samples received to more than one million (not counting withdrawals). At this time, the total number of samples held at the vault was 967,216, representing over 13,000 years of agricultural history. Norway, Sweden, Finland, Denmark, and Iceland's prime ministers ceremonially laid "the first stone" on 19 June 2006. The seedbank is 120 metres (390 ft) inside a sandstone mountain on Spitsbergen Island, and employs robust security systems. Seeds are packaged in special three-ply foil packets and heat sealed to exclude moisture. The facility is managed by the Nordic Genetic Resource Center, though there are no permanent staff on-site. Spitsbergen was considered ideal because it lacked tectonic activity and had permafrost, which aids preservation. Its being 130 metres (430 ft) above sea level will keep the site dry even if the ice caps melt. Locally mined coal provides power for refrigeration units that further cool the seeds to the internationally recommended standard of −18 °C (−0.4 °F). If the equipment fails, at least several weeks will elapse before the facility rises to the surrounding sandstone bedrock's temperature of −3 °C (27 °F), and is estimated to take two centuries to warm to 0 °C (32 °F). A feasibility study prior to construction determined that the vault could preserve most major food crops' seeds for hundreds of years. Some, including those of important grains, could potentially remain viable for thousands of years. Running the length of the facility's roof and down the front face to the entryway is an illuminated artwork named Perpetual Repercussion by Norwegian artist Dyveke Sanne that marks the location of the vault from a distance. In Norway, government-funded construction projects exceeding a certain cost must include artwork. KORO, the Norwegian State agency overseeing art in public spaces, engaged the artist to install lighting that highlights the importance and qualities of Arctic light. The roof and vault entrance are filled with highly reflective stainless steel, mirrors, and prisms. The installation reflects polar light in the summer months, while in the winter, a network of 200 fibre-optic cables gives the piece a muted greenish-turquoise and white light. The Svalbard Global Seed Vault's mission is to provide a safety net against accidental loss of diversity in traditional genebanks. While the popular press has emphasized its possible utility in the event of a major regional or global catastrophe, it will be more frequently accessed when genebanks lose samples due to mismanagement, accident, equipment failures, funding cuts, and natural disasters. These events occur with some regularity. War and civil strife have a history of destroying some genebanks. The national seed bank of the Philippines was damaged by flooding and later destroyed by a fire; the seed banks of Afghanistan and Iraq have been lost completely. According to The Economist, "the Svalbard vault is a backup for the world's 1,750 seed banks, storehouses of agricultural biodiversity." Norwegian law has prohibited the storing of genetically modified seeds at the vault. The adjacent Arctic World Archive provides a similar service for data, which is etched as code into reels of film. Project lead Piql of Norway states that the film, when properly preserved, should last for 1,000 years. Vault seed samples are copies of samples stored in the depositing genebanks. Researchers, plant breeders, and other groups wishing to access seed samples cannot do so through the seed vault; they must instead request samples from the depositing genebanks. The samples stored in the genebanks will, in most cases, be accessible in accordance with the terms and conditions of the International Treaty on Plant Genetic Resources for Food and Agriculture, approved by 118 countries or parties. The seed vault functions like a safe deposit box in a bank. The bank owns the building and the depositor owns the contents of his or her box. The Government of Norway owns the facility and the depositing genebanks own the seeds they send. The deposit of samples in Svalbard does not constitute a legal transfer of genetic resources. In genebank terminology this is called a "black box" arrangement. Each depositor signs a Deposit Agreement with NordGen, acting on behalf of Norway. The Agreement makes clear that Norway does not claim ownership over the deposited samples and that ownership remains with the depositor, who has the sole right of access to those materials in the seed vault. No one has access to anyone else's seeds from the seed vault. The database of samples and depositors is maintained by NordGen. The Syrian Civil War caused another seed bank, the International Center for Agricultural Research in the Dry Areas (ICARDA), to move its headquarters from Aleppo to Beirut. Due to difficulties by ICARDA in transferring its collection, in 2015 the Svalbard Vault authorized the first withdrawal of seeds in its history. The seeds are stored in sealed three-ply foil packages, then placed into plastic tote containers on metal shelving racks. The storage rooms are kept at −18 °C (−0.4 °F). The low temperature and limited access to oxygen will ensure low metabolic activity and delay seed aging. The permafrost surrounding the facility will help maintain the low temperature of the seeds if the electricity supply fails. In the years since its opening, the vault saw minor water intrusion at its entrance during the annual spring permafrost thawing; warmer temperatures and heavy rainfall in October 2016 caused significantly greater amounts of water to inundate the entrance, but the facility's design ensured that the water froze after several meters and the seeds were not endangered. The Crop Trust, officially known as the Global Crop Diversity Trust, plays a key role in the planning of the seed vault and coordinating shipments of seed samples to the Vault in conjunction with the Nordic Genetic Resource Center. The Trust provides most of the annual operating costs for the facility, and has set aside endowment funds to do so, while the Norwegian government finances upkeep of the structure itself. With support from the Bill & Melinda Gates Foundation and other donors, the Crop Trust assists selected genebanks in developing countries as well as the international agricultural research centers in packaging and shipping seeds to the seed vault. An International Advisory Council provides guidance and advice. It includes representatives from the FAO, CGIAR, the International Treaty on Plant Genetic Resources and other institutions. Svalbard Global Seed Vault ranked at No. 6 on Time's Best Inventions of 2008. It was awarded the Norwegian Lighting Prize for 2009. Each seed sample consists of approximately 500 seeds sealed in an airtight aluminum bag. The facility has a storage capacity of 4.5 million seed samples. ^ a b "Work begins on Arctic seed vault". BBC News. 19 June 2006. Retrieved 3 July 2011. ^ a b Mellgren, Doug (27 February 2008). "'Doomsday' seed vault opens in Arctic". MSNBC.com. Associated Press. Retrieved 3 July 2011. ^ a b Hopkin, Michael (March 2008). "Biodiversity: Frozen futures". Nature. 452 (7186): 404–405. Bibcode:2008Natur.452..404H. doi:10.1038/452404a. ^ "Description of the facility". Norwegian Ministry of Agriculture and Food. Archived from the original on 25 February 2012. Retrieved 15 April 2012. ^ a b Charles, Daniel (23 June 2006). "A 'Forever' Seed Bank Takes Root in the Arctic". Science. 312 (5781): 1730–1731. doi:10.1126/science.312.5781.1730b. PMID 16794050. ^ Siebert, Charles (July 2011). "Food Ark". National Geographic. 220 (1): 108–131. OCLC 741814684. ^ "What is NordGen?". Nordic Genetic Resource Center. Archived from the original on 21 April 2012. Retrieved 15 April 2012. ^ "Our Donors". The Crop Trust. Retrieved 20 July 2017. ^ "About Us". Nordic Genetic Resources Center. Retrieved 20 July 2017. ^ Kinver, Mark (31 January 2008). "'Doomsday' seeds arrive in Norway". BBC News. Retrieved 3 July 2011. ^ Aarden, Marieke (26 February 2008). "Opslag met miljarden zaden, voor tijden van oorlog". de Volkskrant (in Dutch). Retrieved 3 July 2011. ^ a b Walsh, Bryan (27 February 2009). "The Planet's Ultimate Backup Plan: Svalbard". Time. Retrieved 1 March 2009. ^ "ARS ships more seeds to genebank facility in Norway". High Plains Journal. 2 March 2009. Retrieved 20 July 2017. ^ "More seeds for 'doomsday vault'". BBC News. 26 February 2009. Retrieved 27 February 2009. ^ 日本人彫刻家の作品が種子貯蔵庫へ (in Japanese). Ministry of Foreign Affairs (Norway). 2009. Archived from the original on 26 March 2012. Retrieved 3 July 2011. ^ Kinver, Mark (13 July 2010). "'Red hot' chillies arrive at frozen seed vault". BBC News. Retrieved 3 July 2011. ^ a b Westengen, Ola T.; Jeppson, Simon; Guarino, Luigi (May 2013). "Global Ex-Situ Crop Diversity Conservation and the Svalbard Global Seed Vault: Assessing the Current Status". PLOS ONE. 8 (5). e64146. Bibcode:2013PLoSO...864146W. doi:10.1371/journal.pone.0064146. PMC 3650076. PMID 23671707. ^ a b Smith, George (26 February 2018). "Seed Vault marks 10th anniversary with 70,000 new samples". New Food. Retrieved 22 October 2018. ^ Duggan, Jennifer (April 2017). "Inside the 'Doomsday' Vault". Time. Archived from the original on 8 April 2017. ^ a b "Deep Freeze". Modern Marvels. Season 14. Episode 34. 25 September 2007. History. ^ a b "Svalbard Global Seed Vault". The Crop Trust. Retrieved 20 July 2017. ^ "Svalbard Global Seed Vault: From safety in permafrost to optimal conditions". Norwegian Ministry of Agriculture and Food. 20 May 2008. Archived from the original on 2 August 2008. Retrieved 18 July 2008. ^ a b c "Banking against Doomsday". The Economist. 10 March 2012. Retrieved 7 May 2014. ^ a b c Fowler, Cary (26 February 2008). "The Svalbard Global Seed Vault: Securing the Future of Agriculture" (PDF). Global Crop Diversity Trust. ^ "Svalbard Global Seed Vault". KORO: Public Art Norway. Retrieved 14 April 2016. ^ "Svalbard Global Seed Vault: Lighting Installation". The Crop Trust. Archived from the original on 23 July 2011. Retrieved 3 July 2011. ^ "FAQ about the Seed Vault - Crop Trust". The Crop Trust. Retrieved 19 April 2017. ^ Deamer, Kacey (1 April 2017). "'Doomsday' Library Joins Seed Vault in Arctic Norway". Live Science. Retrieved 4 April 2017. ^ "Members: Contracting Parties". PlantTreaty.org. Archived from the original on 22 May 2011. Retrieved 3 July 2011. ^ a b "Svalbard Global Seed Vault: Management and Operations". Norwegian Ministry of Agriculture and Food. Archived from the original on 27 March 2010. Retrieved 3 July 2011. ^ "SGSV by Depositor". Nordic Genetic Resources Center. 24 August 2010. Retrieved 3 July 2011. ^ Doyle, Alister (21 September 2015). "Syrian war spurs first withdrawal from doomsday Arctic seed vault". Reuters. Retrieved 22 September 2015. ^ Robins-Early, Nick (22 September 2015). "Syrian War Causes The Global Doomsday Seed Vault's First Withdrawal". The Huffington Post. Retrieved 24 September 2015. ^ Dan, Charles (24 September 2015). "Reclaiming Syria's Seeds From An Icy Arctic Vault". NPR. Retrieved 19 October 2015. ^ "Svalbard Global Seed Vault: Frequently Asked Questions". Norwegian Ministry of Agriculture and Food. Archived from the original on 21 October 2011. Retrieved 3 July 2011. ^ Griggs, Mary Beth (22 May 2017). "Turns out the Svalbard seed vault is probably fine". Popular Science. Retrieved 20 July 2017. ^ Netto, Joseph; Simon, Darran (21 May 2017). "Water breaches 'Doomsday' vault entrance, seeds unharmed". CNN. Retrieved 20 July 2017. ^ Fowler, Cary (Spring–Summer 2014). "A 'Doomsday' Seed Vault to Protect the World's Diversity — An interview with Cary Fowler" (PDF). Journal of International Affairs. 67 (2): 141–146. JSTOR 24461740. Archived from the original (PDF) on 9 December 2014. ^ "Best Inventions of 2008: The Global Seed Vault". Time. 29 October 2008. Retrieved 3 July 2011. ^ "Svalbard Global Seed Vault: Awarded the Norwegian Lighting Prize for 2009". Norwegian Ministry of Agriculture and Food. 4 November 2009. Retrieved 15 April 2012. ^ "More about the physical plant". Norwegian Ministry of Agriculture and Food. 23 February 2015. Retrieved 20 July 2017. ^ "Arctic Seed Vault Opens Doors for 100 Million Seeds". Norwegian Ministry of Agriculture and Food. 26 February 2008. Retrieved 20 July 2017. ^ MacDougall, Ian (12 March 2010). "Norway Doomsday Seed Vault Hits 1/2 Million Mark". U.S. News & World Report. Associated Press. Retrieved 3 July 2011. ^ Dell'Amore, Christine (27 February 2014). "Doomsday Seed Vault's New Adds: "Space Beer" Barley, Brazil Beans". National Geographic. Retrieved 5 May 2015. ^ "A global backstop". Norwegian Ministry of Agriculture and Food. 23 February 2015. Retrieved 5 May 2015. ^ Straehley, Steve (7 March 2015). "Doomsday Seed Vault Adds Tree Seeds for First Time". AllGov.com. Retrieved 5 May 2015. ^ "Combatting Climate Change, One Seed at a Time" (Press release). The Crop Trust. 18 October 2016. Retrieved 20 July 2017. ^ "Major Deposit to World's Largest Seed Collection in the Arctic" (Press release). The Crop Trust. 22 February 2017. Retrieved 22 February 2017. ^ "Svalbard Global Seed Vault". Crop Trust. Archived from the original on 2 January 2019. Retrieved 17 November 2018. Cite error: A list-defined reference named "statsbygg20170520" is not used in the content (see the help page). This page was last edited on 5 April 2019, at 00:08 (UTC).